Description:Short usually black fur. Spade-like forelimbs. small with a pointed snoutPink fleshy snout. It has large digging forepaws and very small eyes. Head/body length: 113-159mm. Tail: 25-40mm. Weight: 72-128g. Males usually larger. , It has a thick, velvety coat designed to help it move both backwards and forwards in small tunnels in the soil. Diet includes worms, insect larvae, beetles, slugs and other invertebrates. Active day and night throughout the year. DietEarthworms are the most important cpart of the mole's diet; an 80g mole needs 50g of earthworms per day. Moles also eat many insect larvae particularly in the summer. Earthworms dominate the winter diet. Moles sometimes collect and store them alive in special chambers. The stored worms are immobilised by a bite to the head segment, 470 worms have been recorded in one chamber. Food is either actively dug out of the soil by the mole or more often collected from the floor of the tunnel. Many soil animals fall through into the tunnels. Moles rarely forage on the surface, most often in times of drought. At five weeks old they are completely self sufficient and are driven from their home territory by their mother. For awhile they live above ground until they find a vacant lot where they can excavate their own tunnel system. It is during the time above ground that they often fall prey to owls, rats, weasels, stoats and foxes, while badgers will readily dig them out of the ground. Males and females are solitary for most of the year, occupying exclusive territories. With the start of the breeding season males enlarge their territories, tunnelling over large areas in search of females. A litter of 3 or 4 naked babies is born in the spring. Fur starts to grow at 14 days, eyes open at 22 days and they are weaned at 4-5 weeks. The young start to leave the nest at 33 days and disperse from their mother's range at 5-6 weeks. Dispersal takes place above ground and is a time of greatest danger. Moles are sexually mature in the spring following birth. Biology & EcologyMost moles don't live beyond 3 years but can live up to 6 years. Their main predators are owls, buzzards, stoats, cats and dogs but vehicles and humans also kill many. Moles create extensive systems of permanent and semi-permanent tunnel tunnels  they can move their own weight of soil every minute!  Surface tunnels are usually short-lived and occur in newly cultivated fields, in areas of light sandy soil and in very shallow soils, where prey is concentrated just below the surface. More usual is a system of permanent deep burrows which form a complex network hundreds of metres long at varying depths in the soilwhich may stretch for a distance of 1000m or more. There will be a system of permanent tunnels about 30-60cm below the surface which are unlikely to be detected from above. It is the shallow, feeding runways which trouble gardeners. The only time an adult mole will come to the surface is to collect leaves and grass to build its nest. This will be located under a larger than normal mole hill (known as a fortress).The deepest tunnels are used most in times of drought and low temperatures. 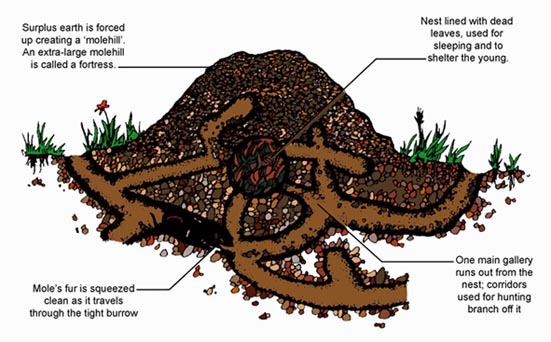 Permanent tunnels are used repeatedly for feeding over long periods of time, sometimes by several generations of moles.Within the tunnel system moles construct one or more spherical nest chambers, each lined with a ball of dry plant material. Nests are used for sleeping and for raising young. A resident mole will never allow another to share its territory, resorting to moleicide if necessary. Remove your resident mole and you expose yourself not only to those creepy nightmarish 'pests', but also to another mole, who will quite happily throw up a new set of molehills all over your lawn. It is not generally understood that molehills are thrown up only once, when the mole first moves in. As this soil is crumbly and weed-free it can easily be removed and used as a top dressing or sterile potting compost, saving some more of the gardening budget. Leave your resident mole alone and soon you will not even know he is there. In their native woodland you would hardly notice their molehills and even the enormous fortress of a nursing mother would be difficult to see. She would have been mated by an incursive mole, between March and May. About four weeks later, in a nest lined with dead leaves, deep in the fortress, she will give birth to up to six red hairless babies. Moles have poor eyesight is very poor but are sensitive to the slightest vibration disapearing quickly underground For his size, he is one of the world's most powerful animals. Never try to put a mole head first down its hole; instead, turn it round and it will disappear backwards into its tunnel, albeit biting you as it goes. Conservation:Moles have no legal protection in the U.K. and are frequently regarded as pests by farmers, horticulturists and green-keepers. Surface tunnelling in newly planted fields may disturb plant roots so much that they will wilt and die. Mole hills cause damage to farm machinery. Mole hills also cause contamination of grass used to make silage. At the beginning of the century moles were trapped in large numbers for their pelts but today they are killed as pests. This is done by trapping and poisoning, both cruel methods. If traps are well maintained and set correctly death can be rapid, although not instantaneous. If the trap is old and rusty or set incorrectly, death is slow and painful. The poison most commonly used is strychnine. Strychnine is normally banned but it can be obtained for killing moles with written permission from the Ministry of Agriculture. Permission is only given to experienced users. Mole tunnels are baited with poisoned worms. Death by strychnine poisoning is slow and agonizing and strychnine is highly dangerous to other wildlife, domestic animals and humans. Fore limbs are used to dig, shearing soil from the sides of the tunnel with alternate strokes. Hind limbs are used to brace the mole's body against the tunnel walls. The mole turns round, scoops up accumulated soil with its fore limbs and pushes it along a previously dug side tunnel leading to the surface. The soil is pushed out above ground to form a molehill.